The Anna Belle Nature Trail Guide answers 30 questions, one for each station on the Trail, located in Greenbelt Maryland and operated by the Prince Georges County Public School System. 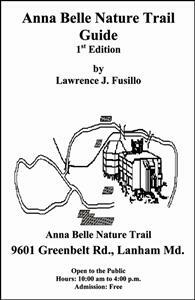 The Anna Belle Nature Trail Guide is a teaching aid for the staff of the Howard B. Owens Science Center, a division of the Prince Georges County Public School System. It can also be used by visitors to the Science Center who walk on the Nature Trail. The “Nature Trail Guide” provides background information on each of the 30 stations on the nature trail. Wetland and forest plants, butterfly and hummingbird plants, herbs and vegetables which are present on the Nature Trail are described. Insects that aid in decomposition of leaf litter and fallen trees into soil are described.